Why Have Private Equity Limited Partners Done a Lousy Job of Protecting Their Interests? Over the next two weeks, we’ll be posting on some of the things that the public can discern now that we’ve called to their attention to the fact that 12 heretofore super-secret private equity limited partnership agreements were unwittingly made public. In many ways, this is an even bigger concern than some of the troubling features in these agreements, because it shows the degree to which investors take these deals on trust. It’s effectively follow-the-lemming: so many institutions and individuals have signed these contracts, surely they must be OK. And as we will demonstrate in upcoming post, these contracts are deficient in far more respects that the SEC lets on. This revelation raises an even more basic question. 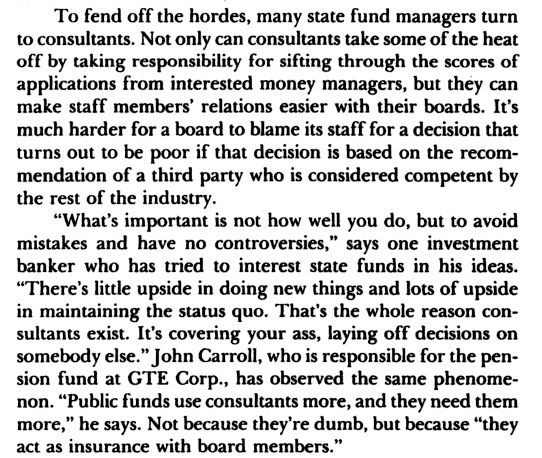 SEC regulations assume that sophisticated investors are better able to take care of themselves than the great unwashed retail public. Hence investments sold to “accredited investors” are subject to comparatively little in the way of SEC oversight. The fact that private equity limited partners have been found severely wanting in their negotiation of investments and ongoing supervision indicates that this assumption is incorrect and much tougher regulations are needed. Several pernicious elements have conspired to give the private equity general partners even more of an upper hand than they would otherwise have. …..modern portfolio theory became the dominant approach for allocating pension fund assets. It encouraged pension fund managers to invest in riskier individual financial products (which would provide higher returns) because they could manage these risks at the portfolio level. As [Steve] Lyndenberg notes, modern portfolio theory “crowded out the more reason-based thinking” that allowed fiduciaries to define prudence and loyalty more broadly. This economic theory transformed the legal framework in which fund managers operated. As anyone who lived through the crisis knows, the idea that diversification reduces risk has its limits. Ironically, the widespread adoption of modern portfolio theory greatly reduced the diversity of investment approaches, particularly among institutional investors. Overconfidence in the ability to diversify away risk led, as Benoit Mandelbrot and his followers like Nassim Nicholas Taleb have pointed out, a tendency to greatly underestimate market risks, which has led to too much willingness to embrace high-risk strategies like private equity. And perhaps more important, you can’t diversify away the risk of fraud or sharp practices, especially when they become widely shared norms. But the consequence of the shift in philosophy was to reduce the vigilance of investors, particularly regarding conflicts of interest and misaligned incentives. A second factor is a whole range of herd behaviors. KKR set many of the standards for how private equity deals were structured in the late 1970s. Perversely, even though most industry assets now come from professional investors, they have not sought to restructure the basic terms of engagement. And the biggest single source of private equity investment, the public pension funds, is particularly subject to “follow the leader” responses. In the 1980s, KKR cultivated the state of Washington’s and Oregon’s pension fund, then considered to be a very forward-thinking investors. The state’s high profile participation in KKR’s funds and endorsement enticed other public pension funds into the pool. And while few will admit to it, much of the industry appears to operate on a convoy system: the smaller pension funds are very much swayed by the fact that reputable, perceived-as-savvy investors like CalPERS and the Yale and Harvard endowments have made significant commitments to private equity. A third is that limited partners rely on experts, both from a pragmatic standpoint (to augment their own team’s expertise and manpower) and to escape liability (the trustees can argue that they’ve behaved responsibly and complied with recommendations of professionals). But the next question becomes: were these experts really doing their job adequately, particularly the law firms that allowed their clients to sign documents that didn’t provide them with enough specificity and recourse? Harvard expects an “illiquidity premium” from private equity over public markets because of the long lock-up periods investors agree to, Mendillo [the Harvard Management CIO] said. “Over the last 10 years, however, our private equity and public equity portfolios have delivered similar results,” she said. And last are many elements of seduction. It’s far more fun, as well as more accessible, to hear private equity firms discuss their war stories of how they pursue investments, the obstacles they sometimes face in acquiring them, and the well-packaged accounts of how they managed them successfully so as to deliver returns. Those sorts of presentations are far more compelling than having hedge fund quants talk about Sharpe ratio and why their market-neutral strategy really is better than conventional market-neutral approaches and really does generate alpha. * And many of the staff at pension funds no doubt hope that they’ll be able somehow to impress the private equity manager enough to land a job with them. In fact, private equity general partners are resume snobs, and greatly prefer men from a short list of elite undergraduate schools and MBA or JD/MBA programs (experience at a prestigious investment bank is a plus). You can count on one hand and have fingers left over the number of people who’ve gone from public pension funds to private equity (once in a while you’ll find a senior executive, more often from a private pension fund, and then hired in a fundraising capacity). This degree of capture is likely to produce an additional outcome over the next few weeks and months with more revelations of dubious private equity practices: a great deal of denial within the pension fund industry. No one wants to look like a dupe. But investors are going to find themselves caught between professing they didn’t know how bad things were, which is tantamount to admitting that their due diligence and oversight was lax or trying to cop that the revelations are no surprise. But the “nothing to see here” position reflects even worse on the investors, since it meant they were at least dimly aware that some practices didn’t pass the smell test, but they chose not to act on their suspicions, out of reluctance to ruffle their precious relationship with the general partners, when many of those general partners, despite their well-cultivated charm, are out only for maximizing their own return. We’ll discuss more on how this overly-trusting attitude has lead to numerous weaknesses in the limited partnership agreements in future posts. * This is actually a very simple hedge fund product, but you get the point. The basis for describing one’s competitive advantage is quantitative, and thus not as emotionally gripping as the stories the private equity general partners tell. As as readers surely appreciate, the more complex hedge fund strategies are more difficult to assess and thus are in some ways a more demanding buy. This entry was posted in Private equity, Regulations and regulators on May 28, 2014 by Yves Smith. In order for it to be a Gresham’s dynamic (i.e. bad ethics driving out good ethics), you have to assume that PE started out good and was corrupted…doubtful. I think the entire PE industry is an outgrowth of Wall Street’s and society’s Gresham’s dynamics. “Over the last 10 years, however, our private equity and public equity portfolios have delivered similar results,” [Harvard’s CIO] said. Even worse, publicly-traded equities are currently priced to deliver a 2.3% annual return over the next 10 years (see Dr. John Hussman’s May 26th weekly column). Subtract 2/20 general partner fees from a 2.3% gross return, and limited partners can expect to net approximately ZERO on current-generation PE investments. Public equity is not private equity. And actually, yes. Investors are in close to consensus belief that PE outperforms stocks by ~300 bps. Even McKinsey promulgates this belief….after stating that only 2 decent studies on the strategy have been done in the entire 30+ year history of PE investing. An extensive reading of PE performance studies in the excellent new book Private Equity at Work reaches far more nuanced conclusions, the biggie being that the best studies show far more modest to no outperformance, and most investors seek that 300+ bps premium to compensate for the illiquidity risk. So that’s the long-winded way to get to Harvard’s bottom line, that meeting stock index performance is actually underperformance because you aren’t earning enough to compensate for the lack of liquidity.